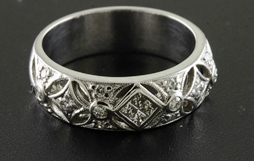 This stunning band encircles the finger like shards of ice. Created to stand alone or to be stacked with other rings. These delicate looking bands are quite versatile. 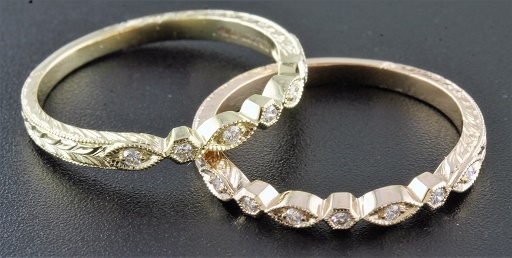 They come in 18kt white, yellow and rose gold. A delicate band that looks beautiful against an engagement ring or stacked along with other bands. This band sits like brilliant ice across the finger. 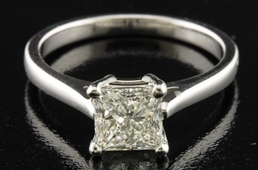 Nicely proportioned princess cut diamonds are what draws the eye here. This is a stand alone piece. 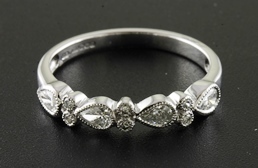 Designed with pretty open work and interspersed with bright diamonds. Beautiful paired with an engagement ring or on its' own! A very unique and vintage look. 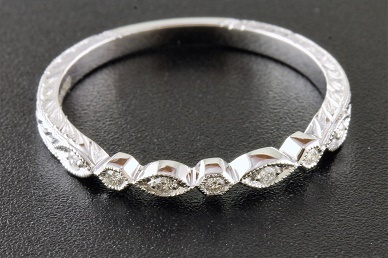 This eye catching band has a mix of diamond shapes. 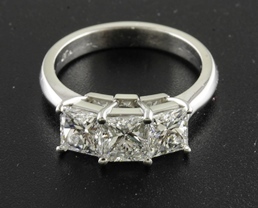 An elegant and clean lined piece set with very well proportioned princess cut diamonds. 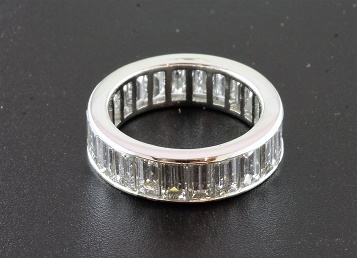 The simplicity of this ring allows the diamonds to take center stage. Three sparkling diamonds to signify the past, the present and the future. This ring offers special meaning and the added bonus of being a stunner. An appropriately named stone for the princess in your life! 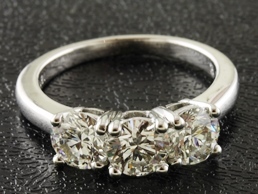 This stone is a stunner! 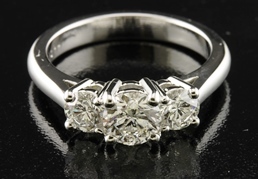 Classicly set in four prongs, nothing detracts from the simple beauty of the 1.40ct diamond. A sophisticated look and clean design are the hall marks of this piece. 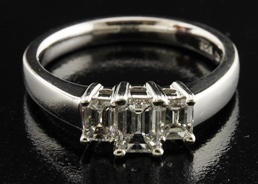 Three beautifully proportioned and colorless emerald cut diamonds are sure to dazzle! These amazing stones glint like ice on the finger. 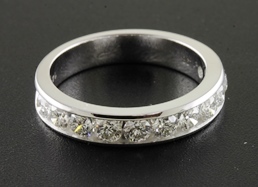 The past, the present, the future is the symbolism of this gorgeous three stone ring. The center round brilliant diamond weighs .72ct and is F color. The total weight of the side diamonds is .65ct, E-F color. This ring holds promise and strength.